West Indies have been in Bangladesh for a week, but they still looked jetlagged in a bizarre innings of 129 for 7, which set up another comprehensive win for India, who were excellent with the ball. From the moment Bhuvneshwar Kumar surprised Dwayne Smith with a first over full of outswingers, West Indies sleepwalked through most of their innings, failing to make India pay for some sloppy fielding. India will be only mildly annoyed with that because of the stupendous work done by their bowlers. Bhuvneshwar set the template with the most economical figures in Twenty20 internationals – 3-0-3-0, Shami kept the pressure up at the other end, R Ashwin bowled out pretty early to make sure that pressure pushed West Indies to the breaking point, and then Amit Mishra applied the coup de grâce with the wickets of Marlon Samuels and Dwayne Bravo off successive deliveries. 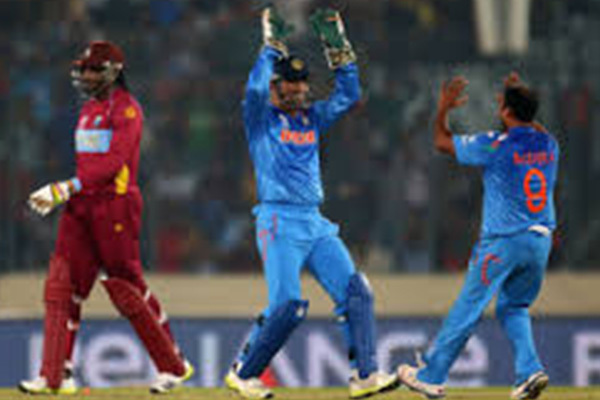 Without taking away from how well India bowled, it was an incredibly passive effort from West Indies. Despite a generous helping of extras, West Indies were 46 for 1 after 10 overs, Chris Gayle’s 34 off 33 was his slowest 30-or-more-ball knock, Dwayne Smith prodded and fumbled around for 11 off 29, and the rest crumbled under the pressure of needing more than 100 in the last 10 to even be competitive when the dew would come in. All this despite two dropped catches: Gayle on 0 and 19.